Hi Fuzzy Fivers! Looks like our heroes are having some misgivings about joining this frizzy red Bluppo’s master plan. What does he really want, anyway?? Decisions, decisions. It’s going to take the Fuzzy Five a while to decide what to do…and we’ll be taking a quick 2-week hiatus while they think about it! Writer Charles is on vacation, so we’ll have a couple of sweet pinups while we wait and see what happens next! 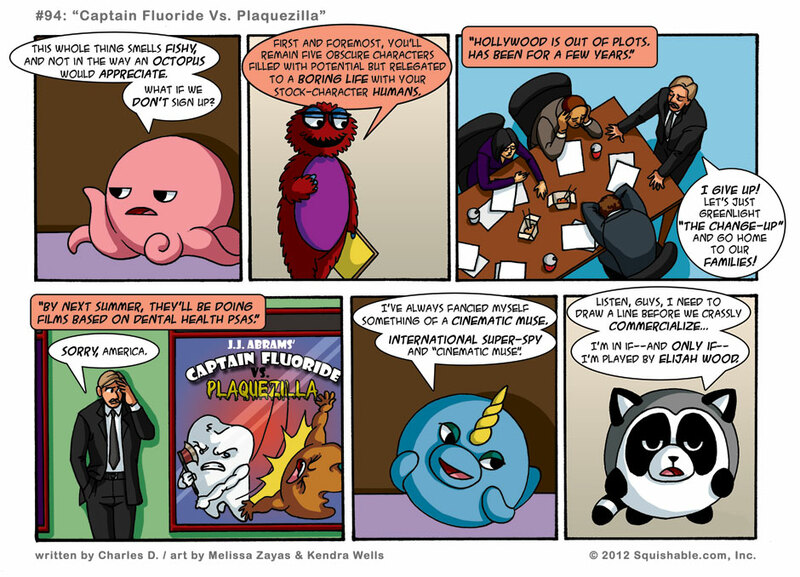 Who knows, maybe the Fuzzy Five will just decide to go see Captain Fluoride Vs. Plaquezilla–A Teeth-Chattering Adventure brought to you by the creator of LOST and Fringe! Hey, it may sound corny, but whatever…the only movie creator I trust more than J.J. Abrams is Peter Jackson. Besides, Captain Fluoride just has to be better than Green Lantern. See you laters! Right now, Plaquezilla is making me feel like I gotta brush my teeth. this post has just reminded me that I need to make a long overdue appointment with my dentist! But who will play Nina Jr in the movie?! Or will Nina JR play the role instead? Inquiring minds must know! XD I AM LITERALLY LAUGHING SO HARD AT THE GREEN LANTERN JOKE!!!!!!!!! !